WKU's Forensics Team members traveled to Tuscaloosa, Alabama, to compete in two tournaments the weekend of October 6-7. 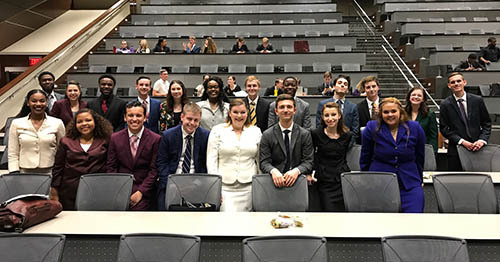 WKU captured the team sweepstakes championship at both tournaments, ahead of 15 other schools, including the University of Texas at Austin, George Mason University and Bradley University. In all, the students won 15 individual events, and senior Andrea Ambam was named the most successful competitor of the weekend. Next weekend the team will travel to Muncie, Indiana, to compete at the Ball State University “Age of Aquarius” Swing tournaments. Andrea Ambam, a senior from Peculiar, Missouri, tournament champion in individual sweepstakes, tournament champion in after-dinner speaking, tournament champion in prose interpretation, tournament champion in poetry interpretation, tournament champion in programmed oral interpretation and second in informative speaking at the Crimson Classic tournament; tournament champion in after-dinner speaking, second in individual sweepstakes, second in programmed oral interpretation, third in poetry interpretation and sixth in prose interpretation at the Alabama Alumni tournament. Derek Collins, a sophomore from Hattiesburg, Mississippi, tournament champion in informative speaking, tournament champion in duo interpretation (with Emma Warnecke), fourth in individual sweepstakes and seventh in prose interpretation at the Crimson Classic tournament; tournament champion in informative speaking, tournament champion in persuasive speaking, second in duo interpretation (with Emma Warnecke) and tournament champion in individual sweepstakes at the Alabama Alumni tournament. Bradley Wascher, a junior from Montgomery, Alabama, tournament champion in extemporaneous speaking, tournament champion in communication analysis, second in individual sweepstakes and third in impromptu speaking at the Crimson Classic tournament; tournament champion in communication analysis, third in impromptu speaking, third in individual sweepstakes and fourth in informative speaking at the Alabama Alumni tournament. Emma Warnecke, a sophomore from West Bloomfield, Michigan, tournament champion in duo interpretation (with Derek Collins), third in prose interpretation and sixth in individual sweepstakes at the Crimson Classic tournament; second in duo interpretation (with Derek Collins), fourth in persuasive speaking, fifth in prose interpretation and sixth in individual sweepstakes at the Alabama Alumni tournament. Rickey Williams, a sophomore from Minneapolis, Minnesota, tournament champion in duo interpretation (with Ryan Gosling) and sixth in informative speaking at the Alabama Alumni tournament; fourth in poetry interpretation and fifth in duo interpretation (with Ryan Gosling) at the Crimson Classic tournament. Ryan Gosling, a sophomore from West Palm Beach, Florida, tournament champion in duo interpretation (with Rickey Williams) at the Alabama Alumni tournament; fifth in duo interpretation (with Rickey Williams) and sixth in prose interpretation at the Crimson Classic tournament. Faith LoPiccolo, a junior from Lexington, second in prose interpretation, second in after-dinner speaking, fifth in individual sweepstakes and seventh in persuasive speaking at the Alabama Alumni tournament; fourth in persuasive speaking and fifth in after-dinner speaking at the Crimson Classic tournament. Casey Child, a senior from Taylor Mill, second in informative speaking, third in dramatic interpretation, third in prose interpretation and fourth in individual sweepstakes at the Alabama Alumni tournament; third in poetry interpretation at the Crimson Classic tournament. Sabas Del Toro, a senior from El Paso, Texas, second in dramatic interpretation and fifth in prose interpretation at the Crimson Classic tournament. Kelly Lingen, a freshman from Lakeville, Minnesota, second in poetry interpretation at the Alabama Alumni tournament; fifth in poetry interpretation at the Crimson Classic tournament. Reese Johnson, a freshman from Burnsville, Minnesota, third in duo interpretation (with Matt Wisenden) and fourth in dramatic interpretation at the Alabama Alumni tournament; fourth in dramatic interpretation at the Crimson Classic tournament. Matt Wisenden, a senior from Moorhead, Minnesota, third in duo interpretation (with Reese Johnson) at the Alabama Alumni tournament; fourth in informative speaking at the Crimson Classic tournament. Corey Newsome, a sophomore from Morehead, fourth in communication analysis at the Crimson Classic tournament; fourth in prose interpretation at the Alabama Alumni tournament. Brian Anderson, a senior from Hodgenville, fourth in extemporaneous speaking at the Alabama Alumni tournament. Symone Whalin, a sophomore from Sonora, fourth in after-dinner speaking at the Alabama Alumni tournament. Paige Allbright, a freshman from Youngsville, Louisiana, fifth in dramatic interpretation at the Crimson Classic tournament. Tayland Ratliff, a sophomore from Youngsville, Louisiana, sixth in poetry interpretation at the Crimson Classic tournament; sixth in dramatic interpretation at the Alabama Alumni tournament.